Classes for children of PK-8th grade take place on Sunday mornings. Registration for these sessions begin in the Spring and continue through the summer months. Please never hesitate to contact the Religious Education Office with any problems or questions. The fees listed below help defray the cost of the Religion book, materials, postage, catechist preparation and other operating expenses of our program. Registration begins in the the Spring of the year to afford our office the time needed to set up quality programming. If there is ever a case of financial need or temporary financial problems, never hesitate to call the office and the fee can be waived. Each class your child is to attend is very important. Their attendance and promptness is important. We realize that sometimes it is impossible to attend class, please call if your child is sick or unable to attend class. Many of our catechists have a make-up assignment that your child can do at home. After two (3) consecutive absences without notification, we will call home to make sure everything is alright. 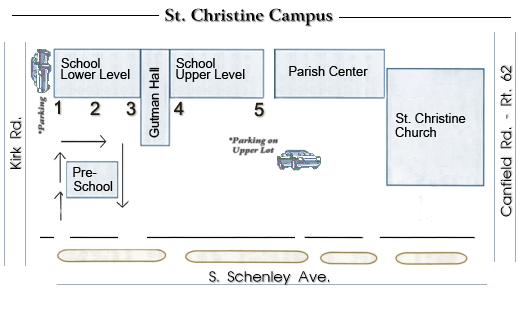 It is of the utmost importance that an arrival and dismissal plan is designed and executed precisely at St. Christine because of the number of children in the various programs. For the safety of our children as well as all involved, we ask that you comply with these guidelines. All children are expected to arrive on time, so please plan to have your child(ren) here a few minutes before classes are to begin. Long waits for the children are discouraged. NO child is allowed in the classroom until their teacher is present. They are to stand in the hall outside their room. Always enter the parking lot by the narrow drive nearest Kirk Rd. (at the top of St. Christine Pre-School. See map below. Drop your children of at one of the doors, without obstructing the flow of traffic. Please caution the children to watch for moving cars. Never park in a crucial area of traffic. Parking areas are indicated on the map using the car symbol, if you want to bring your children into the building or need to stop in the office. Always exit the parking lot by the wider drive. The right and left sides of the driveway should be used respectively for turns. See map below. In case of inclement weather, please call the office to see if classes have been cancelled. We do make an attempt to call all families in the program to notify them. Because of the pre-recorded format on the radio stations on Sunday mornings, we cannot notify them.